"Andi Mack" Season three premieres MONDAY, OCTOBER 8 (8pm ET/PT) on Disney Channel. In the season 3 premiere of Disney’s Andi Mack, there’s a particular scene that captures the familiar woes of an increasingly complicated teenage life. Andi, the title character, played by Peyton Elizabeth Lee, aided by a flurry of nervous hand gestures, is fretting about an awkward social encounter. She sputters like a frayed engine as she tries to get a coherent thought out to her mom. It can only be boy problems. And so, Disney dives into a new fall season of Andi Mack, grappling with all the confusion and cringe-worthy middle school moments that the whole of America can relate to. But in person, Peyton Elizabeth Lee is none of the babbling, ambivalent teenager on screen. She’s thoughtful, well-spoken, and clear on the cultural significance of the show for Asian American representation, especially within kids programming. “Andi Mack really normalizes diversity,” Lee said. “I think Andi Mack is such a cool way to incorporate culture into a normal everyday show about some kids growing up.” The show is created and executive produced by Terri Minsky McGuire, and the new season premieres Monday, October 8, 2018 at 9pm ET/PT on Disney Channel. At 14 years old, Lee is already wading through the heavy cultural climate that Hollywood is presently struggling with. Asian American representation recently hit its apex, with Crazy Rich Asians breaking box office expectations and streaming services funding diverse projects, but as the movie resonated with adults starved for media presence, Andi Mack is arguably breaking barriers when it matters — for pre-teen kids first forming their notions about the world around them. Lee emanates a maturity not yet fully coalesced in her Disney character, and her chic outfit during an interview in Burbank last week — black leather skirt, white blouse polka-dotted with black hearts, and hot pink spiked heels with the same pop of color on her lips — reflects it. It’s clear that she’s spent time ruminating on the progression of Asian identity in Hollywood; her Asian -American fans have said as much to her. Andi Mack aired last year, before the 2018 teen romance Netflix film To All The Boys I’ve Loved Before which also starred a mixed race teen character, and it quietly establishing itself as a relatable coming-of-age story among the youngest generation. And while the show shares the same cultural roots as ABC’s Fresh Off The Boat, the premise isn’t about the immigrant experience or bumpy assimilation. It’s the exact opposite: The show follows three generations of Asian American women, a racial dynamic never fleshed out before on television, as they live their (very normal) lives. It’s one of the first to present an Asian American family as simply American, without accents or tired stereotypes, while also navigating difficult themes, like divorce and coming out at a young age. And mixed-race Americans are a part of that experience. 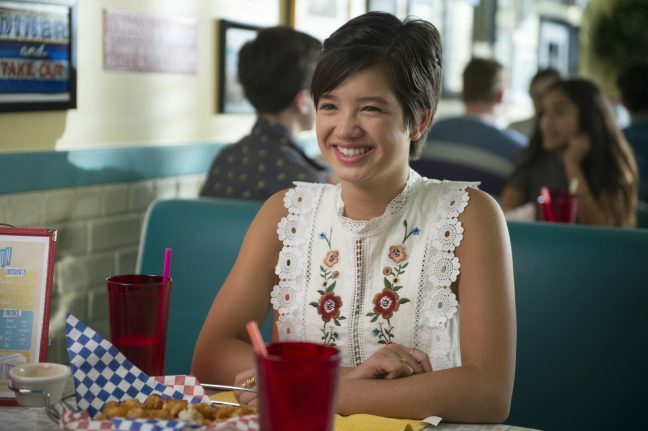 Bowden revealed that Andi Mack is the first project she’s been in that honored her specific ethnic makeup and addressed her actual racial background, and the cast gives the credit to Lee. None of this would have happened if Lee, at the young age of 11, had not nailed her audition, said Lauren Tom, the actress who plays Andi’s grandmother Cici. The titular character was originally meant to be cast as a white Jewish girl. As season 2 featured an episode on Chinese New Year, season 3 will highlight another major Chinese tradition as well: the mid-Autumn moon festival, a yearly event that brings families together to celebrate the harvest under the full moon. Shooting the episode was a chance for the set’s mixed race girls to delve a bit deeper into their heritage. 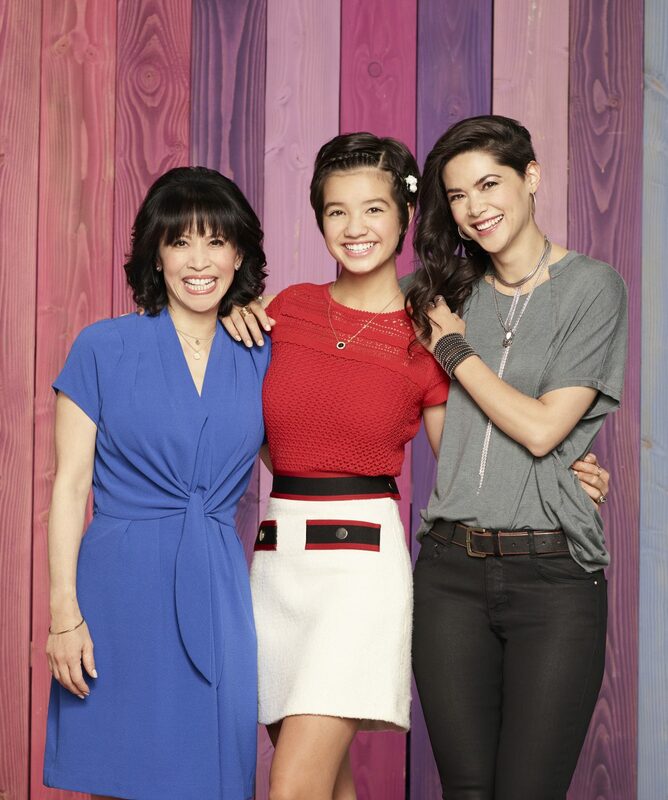 While Andi Mack is certainly about the celebration of the characters’ Chinese heritage, the actresses are also proud of the unorthodox family dynamics and often tricky subjects explored in the show. Bex is a young mom who’s trying to settle into her life. There’s a constant will-they-won’t-they question as she tries to figure out where she stands with Andi’s father. And Andi herself, still adjusting to the revelation that her wild, independent older sister is actually her mom, negotiates this as she tries to get her parents back together. The heart of the story lies in Andi’s journey of self-discovery, and the simple premise of the show belies the sweet sophistication of the storylines. It’s certainly one that will see its cultural effects on the American landscape long after it’s gone. CAAM asked each of the actresses about Asian American representation in the current Hollywood landscape. HOW WILL ANDI MACK AFFECT THE NEXT GENERATION AND HOW THEY VIEW PEOPLE OF DIFFERENT RACES? BOWDEN: To be able to get into storylines that are specific and may not be like their own that show people for all of the complexities that they are really promotes empathy. I think it’s really important to have these storylines in children’s and teen television programming because it sets the reality for them, because for so many kids, Andi Mack will be one of their first shows that they really connect with perhaps because they simply haven’t seen a lot of shows yet. WHAT ARE THE CONVERSATIONS LIKE BETWEEN THE CAST ABOUT ASIAN CULTURE AND ASIAN REPRESENTATION? TOM: There are certain aspects of being Asian that we wanted to present to the kids to teach them about the culture of being Asian, but at the same time, I love that those episodes are very specific to that and all the other episodes don’t’ really mention the fact that we’re Asian. Nothing’s that’s been harped on. We’re just an American family that happens to be Asian. I feel like we’ve actually come pretty far from the ‘90s. Of course, there’s still further to go but I’m certainly encouraged. LEE: I think I’ve definitely taken it for granted, seeing people that look like me on screen and hearing their stories is something that I’ve grown up with but talking to Lilan and Lauren and hearing that wasn’t the case when they were growing up and especially in this industry there’s so much stereotyping. HOW DOES THE CURRENT ASIAN AMERICAN REPRESENTATION DIFFER FROM WHAT YOU SAW GROWING UP? LEE: I never really saw how much it meant to me to see myself represented until I saw Crazy Rich Asians, and there is this feeling, this empowerment, this inspiration, when you do see someone that looks like you represented on screen especially in such a fun movie. TOM: When I got hired to be in the Joy Luck Club (as Lena, one of the daughters), one of the first things I wanted to do was to thank the generation of actresses that were playing the mothers in that movie for having paved the way for our generation because it’s still important to acknowledge the whole lineage of where we come from and the generation before them. BOWDEN: I don’t remember when I was the age of Andi Mack having that kind of specificity when it came to being Asian American. I barely saw Asian Americans on TV, and if I did they were a side character or they were something to set up the storyline of the main character. I think when you see yourself or someone like you represented on television, it validates who you are and it empowers you. So shows like this, I hope, are empowering people who have similar characteristics and they can feel like their stories are just as valid as the stories that are mostly represented on TV. Angela Chen is currently a freelance reporter in Los Angeles. 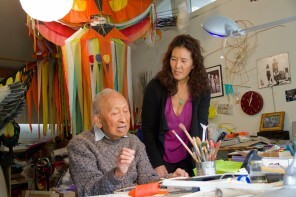 Her work has appeared in The New York Times, Huffington Post, Bustle, and Backstage. But most of her career has been in television news. She was most recently a reporter at KRIV-TV Fox 26 News in Houston. Before that, she reported at stations in Reno, New York City, and San Diego. Angela graduated from UC San Diego with degrees in World Literatures, Writing, and Psychology. She also earned a Master of Science from Columbia University’s Journalism School. She is fluent in Mandarin, loves Futurama and is an active member of the Asian American Journalists Association. The interview has been edited for length and clarity. The article is made possible by Comcast.